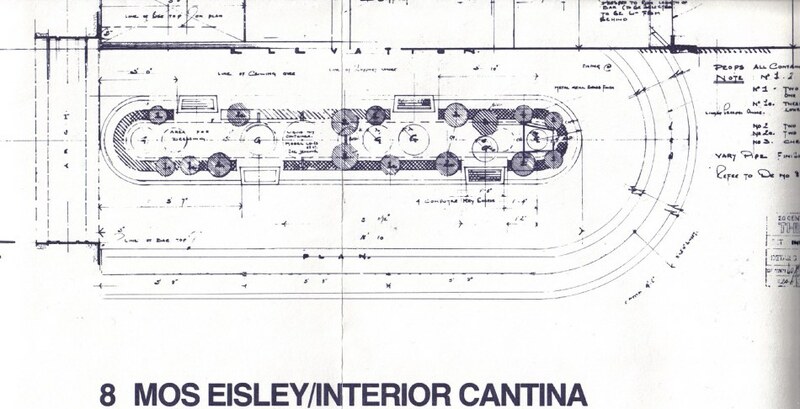 This is a blue print of the Mos Eisley Cantina that appeared in the Star Wars Techincal Journal. 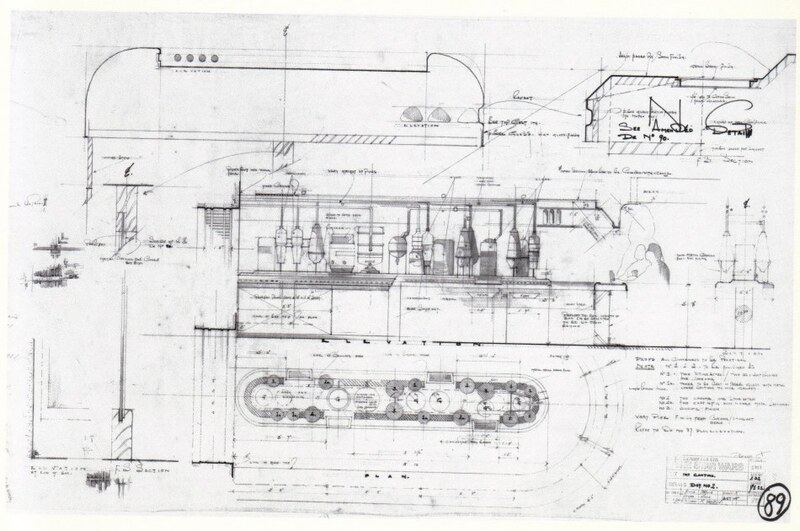 This was probably the first (un)offical attempt to creat a blue print of the Cantina. For the most part it works, however there are a few problems. First off the entrance door is not correct. 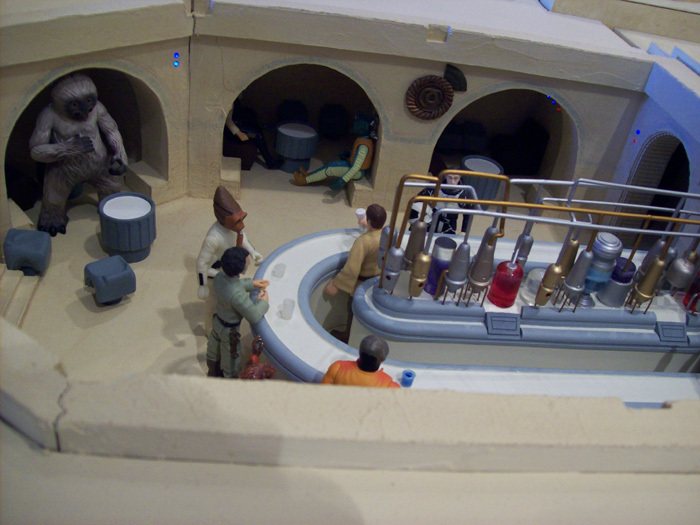 The Cantina actually sits sideways to the entrance and the patrons enter the bar area by turning left in the foyer. Also the table arrangement is not quite right. 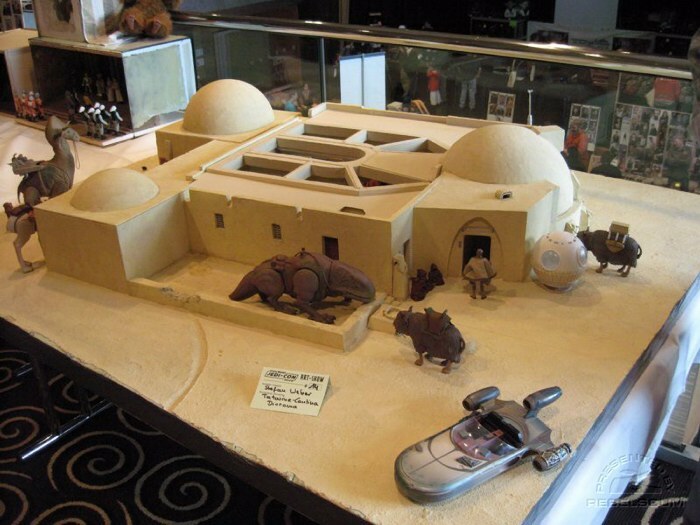 However, this was a very good first attempt at blue printing the Cantina. 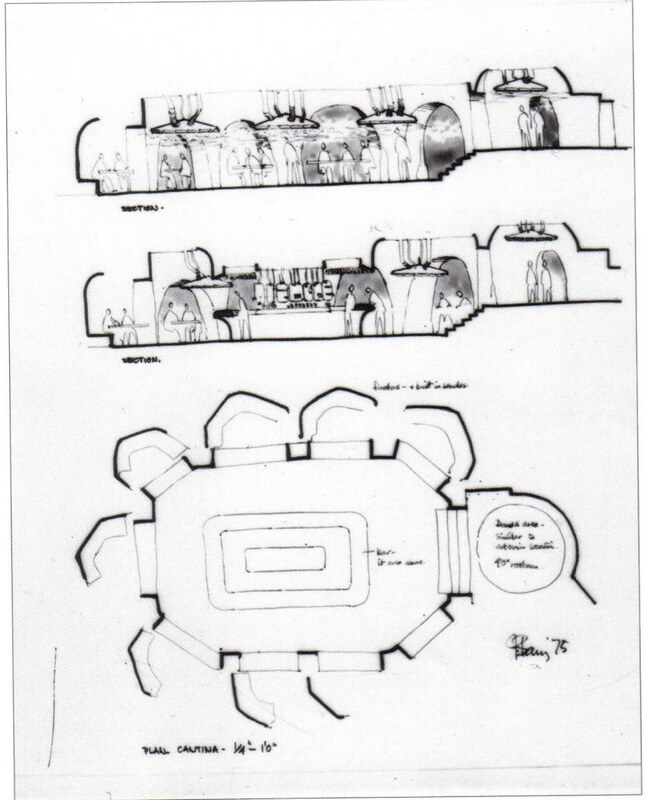 First known sketch of Mos Eisley Cantina based on instructions from George Lucas taken from the Making of Star Wars book, notice the foyer is a semicircle with the entrance coming off the side of the Cantina. 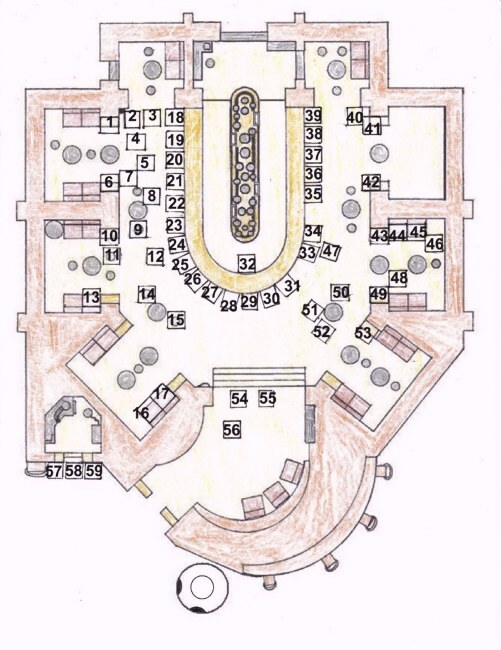 The floor plan is almost identical to the built set, except for the angled alcoves in the bar which left room for a full circle bar. 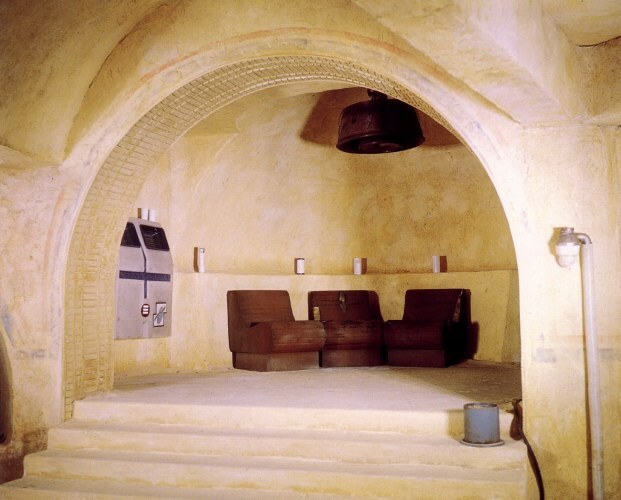 This is a photo of a "mock up" of the actual Cantina set in the movies. Notice each alcove has an arched ceiling, which is one of the reasons the table placement in the Tech Journal's blue print will not work. Another thing is that the patrons enter the cantina and walk through a curved foyer, NOT a straight foyer as drawn in the Technical Journal. Also, notice no arched ceilings in the back behind the bar area. This leads me to believe that area was intented to represent storage areas and restrooms. If you've ever been in an actual bar/pub all the restrooms are always past the bar at the back of the room. This way coming or going to the bathroom, you always pass the bar (an opportunity to buy a drink). 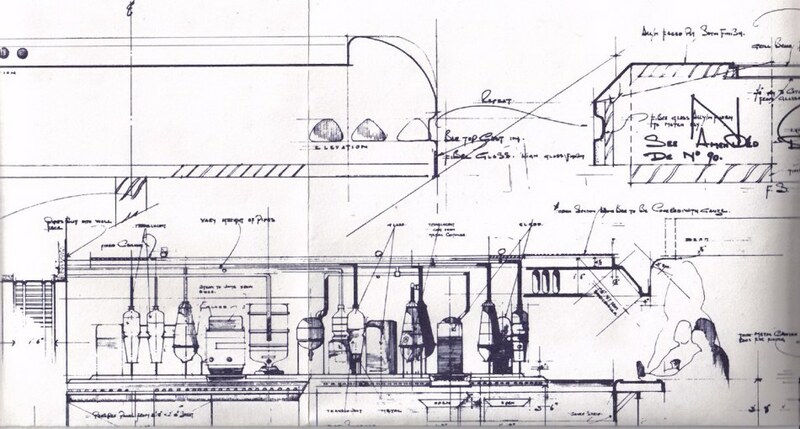 Here is the blueprint of the actual Cantina bar set. I don't think the actual prop had the computer keyboards, but its hard to tell. However, the layout of the different drink canisters looks the same. 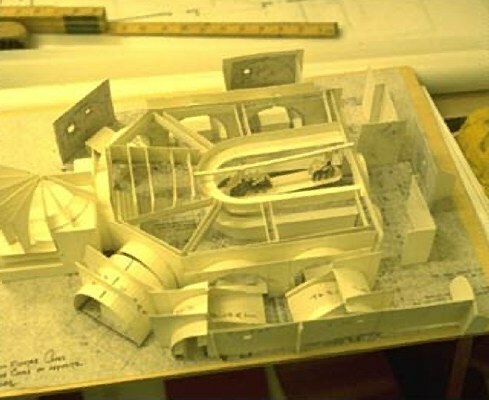 production photo of foyer of Cantina, notice the foyer makes a curve and patrons enter from the side, also notice that the entrance is not symetrical will the 2 alcoves; meaning there is more space between the entrance and the alcove to the right (notice the lamp) and the alcove to the left. notice in this picture, that the "alcoves" behind the bar are not "alcoves" at all. This is just an open space with boxes (no tables) used for storage. 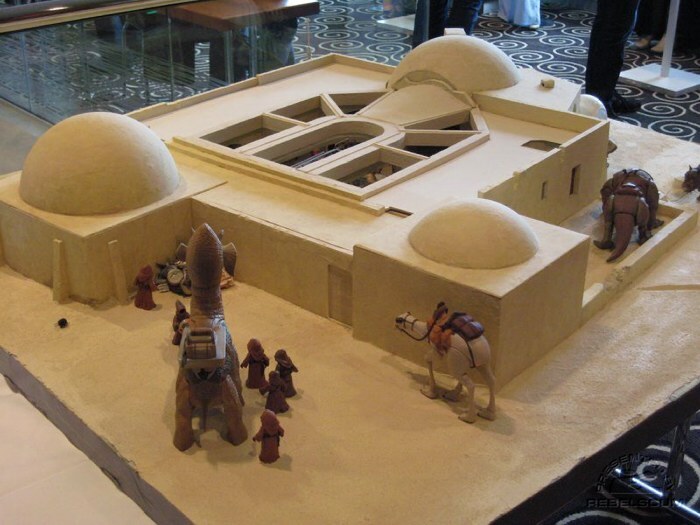 This is a picture of a diorama of the Mos Eisley cantina. It was made by famous architectural artist, Herb Gundt, and featured in a five-page layout in the former Star Wars Gamer magazine, volume 2, #2, 2001. 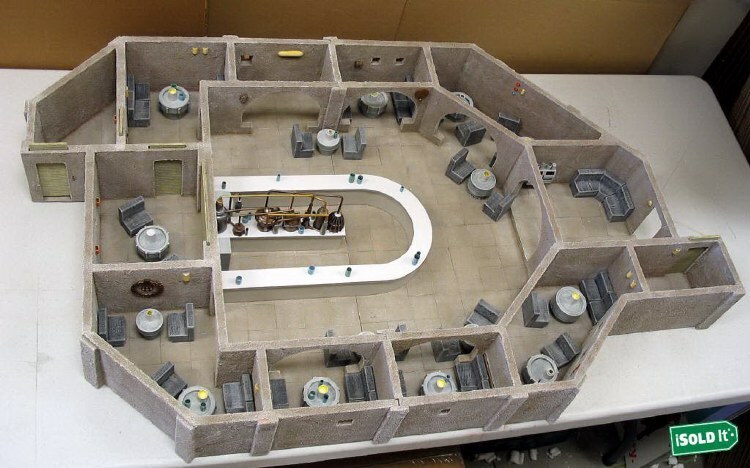 It was built to scale to be used with the Star Wars RPG and Hasbros 3-3/4 action figures. 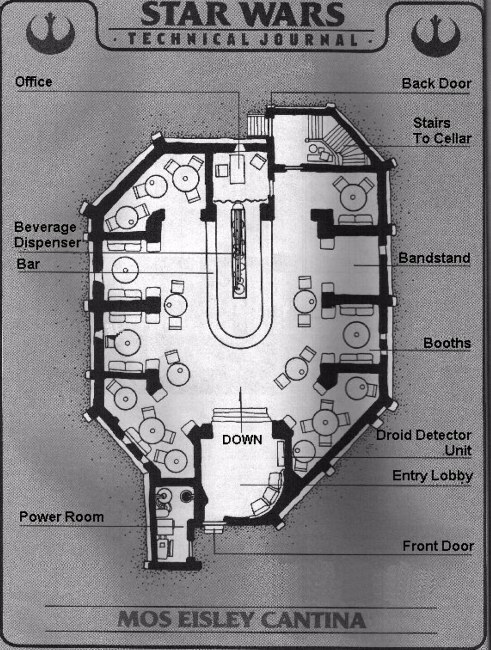 The design is based upon the floor plan found in Starlog & the Star Wars Technical Journal. 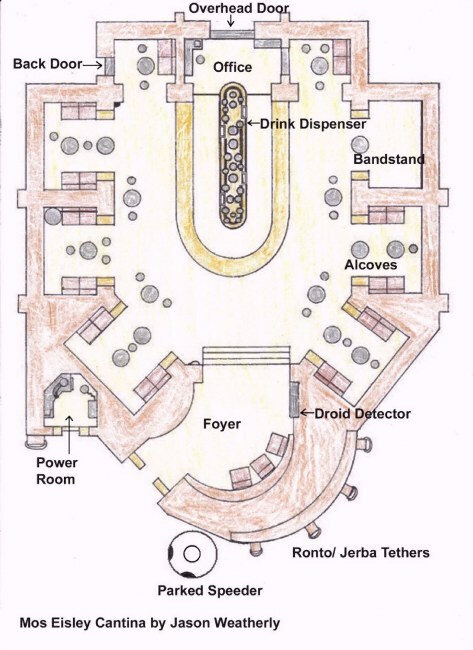 Here is my drawing of the floor plan of the Mos Eisley Cantina. I have tried to make it as movie accurate as possible; taking into consideration the inside set of the Cantina compared with the exterior of the actual building used. You will notice that the exterior wall of the entrance of the cantina has a slight angle to it. 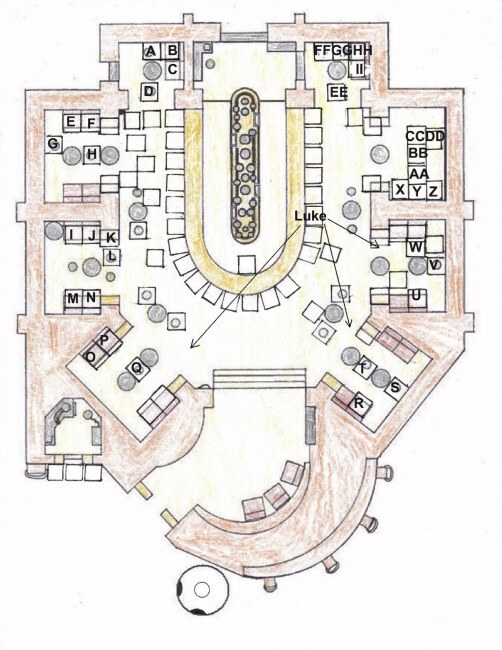 Also, compare movie photos with the original sketch at the top of the page and you will see that the foyer is circular with the entrace coming off to the side. The only thing not really seen in the movie is the area behind the bar, so a little creative liberties have been taken to try to fit all the characters into their "proper" place. Below is my attempt to map the location of each patron in the original Cantina scene (minus the extra aliens). With all the action going on in the Cantina, it would be impossible to get an exact location. This character map is based upon character placement when Luke & C-3PO enter the Cantina, taken from a comparison of still photos, the original Cantina scene, and the movie scene. A few characters are put in certain places by default; meaning they are not actually seen in that particular shot during the opening scene, but they are seen in that area or close by in other scenes. Below is another character map in which I have attempted to place the additional alien shots into their proper places in the actual Cantina. 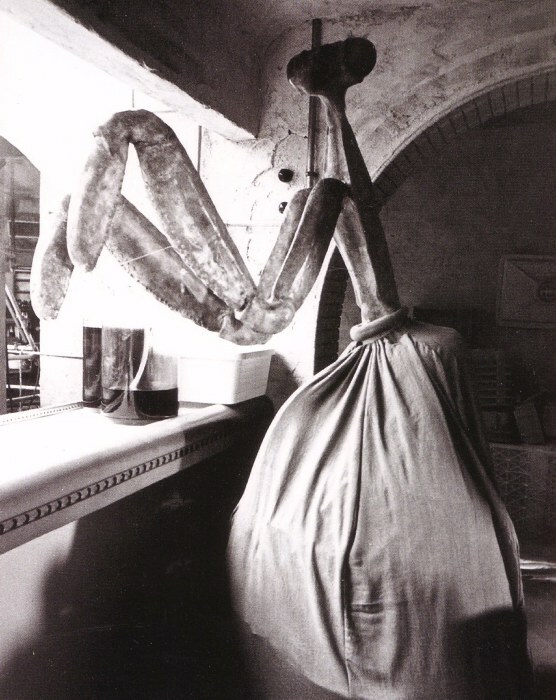 The problem is, that most of the alcoves can easily been seen in still shots of the Cantina in which NONE of the aliens appear. Also, Lucas wasn't very careful at continuity issues during the Cantina scenes. So, some of these placements are based on a process of elimination. Other factors include Luke's view point from the bars and the direction he turns, and then which aliens are depicted. explanation: even though Elis is not seen in the scene with Feltipern & M'iiyoom in the actual film, still photos show us that this character was in the same alcove with them. during the Greedo vs. Han scene, Elis' head and a Duros can be seen in the backgroud. So the back left alcove of the Cantina seems to be a good place for this group. explanation: after Han shoots Greedo, Myo looks over his left shoulder to see what happens. meaning that he is sitting to the right of Han's alcove. explanation: when Luke is standing at the bar he looks off to his left in front of him, and then we see the two Duros talking with each other. Melas is placed with them by default, there is no indication from the film as to where he actually sits. explanation: at the bar Luke looks directly behind himself and then we see these aliens. explanation: actually, just a process of elimination; really no where else to put them! both the Tech Journal & the DK cross-section book place the bandstand here, so it seems like a good place. explanation: again, process of elimination; I'd actually like to place them closer to the door to work with that "in your face" entrance, but it just doesn't fit that way. 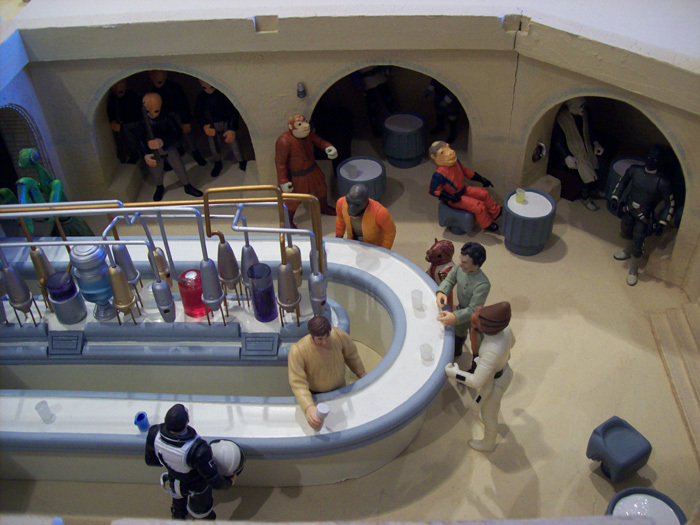 Diorama of the Mos Eisley Cantina at the Jedi Con in Europe by Stefan Weber. 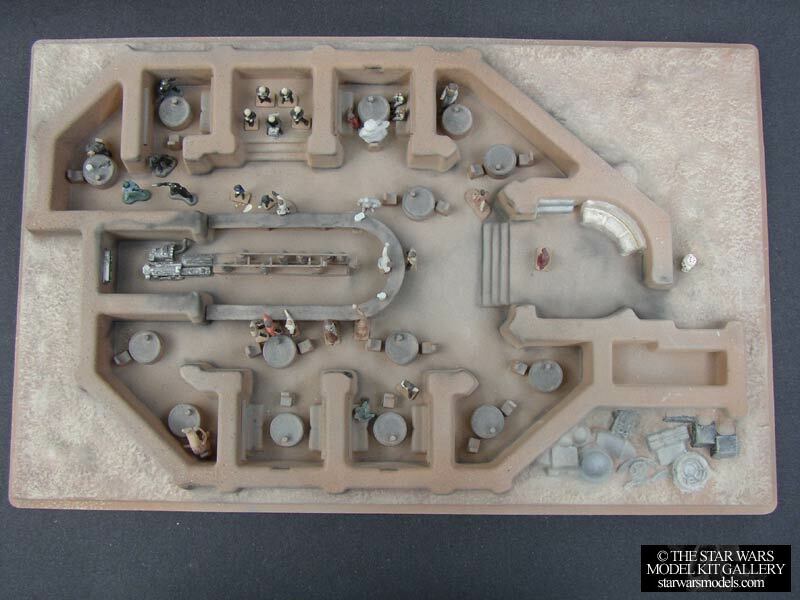 This is to date the best diorama of the Cantina that I have seen!